Deer hunting tree stands are important tools used by avid hunters today. They keep the hunter at a height above a deers line of sight, allowing them to focus taking aim and getting the shot without being detected by the deer. A tree stand allows a much better view of the surroundings because of it's higher vantage point. They also help to keep a hunter's scent up and away from a whitetails keen sense of smell. Hunting treestands are especially prefered by bowhunters and allow them to get deer to closer ranges for a more desirable shot. Being above the deer's line of sight allows for some movement by the hunter for drawing his bow in preparation for a shot. What Type of Tree Stand Should You Choose? That all depends on where, when and how you will be hunting from that stand. Each stand type has advantages and disadvantages based on the hunting situation. For example; it would be hard to use a climber in an area where there are trees that have low hanging limbs, like a hemlock woods. Your ability to climb into your stand is a factor as well... if you have a hard time climbing a ladder... you may want to consider a climber that does the climbing for you. If your hunting involves several different hunting situations, you may need more than one type of tree stand. How long will you be in the stand? The longer you sit, the more comfortable you are going to want to be. That means choosing a stand with a comfortable seat and a good foot rest. If you are the kind of hunter that would rather stand when you hunt you will need a big enough platform so that you can get into a good comfortable stance with the ability to shift your feet if they get tired. Obviously a big hunter needs a bigger stand. There is nothing worse than feeling all cramped for hours because your seat is too small or your platform doesn't allow you to get your feet in a comfortable position. Remember too, the stand need to be of a rating ample enough to hold your body weight. 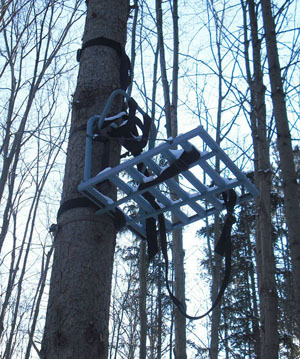 It is vital that the tree stand you purchase is safe, strong, stable and functional. Buy a tree stand that is approved by the Tree stand Manufacturer's Association [TMA]. Tree stands certified by the TMA are commercially designed using the highest quality materials, and tested to meet high standards.